I like making a foods that are a concept more than a recipe. A concept dish has a central idea to it, that you can run with in any direction that you please. Dishes in this category include pizza, many pasta dishes, a stir fry, a sandwich, many soups and stews, pasta salad, or any salad for that matter. The structure of a concept dish is based on a few central and necessary components. For a pizza, this would include a crust and toppings. It can go anywhere from a traditional tomato sauce/cheese/pepperoni to topping a gluten free pizza crust, vegan “renotta*” and roasted red peppers. Foods like these accommodate my cooking style. They allow for imprecision, experimentation, and using whatever is fresh from the garden or farmer’s market. A conceptual recipe can be influenced by a certain cuisine, or an ingredient in the fridge that needs to get used up. They can even have multiple influences, such as the salad I’m about to share; one of the most enjoyed meals of the summer which had no less than 3 sources of inspiration. The first inspiration is the Cobb Salad at Salut in Saint Paul. I ate this salad several times a week in the count-down days leading up to our wedding when our nightly meal had an agenda and was a business meeting more than a relaxing al fresco dinner at a bustling brassiere across the street from my apartment. The Salut Cobb salad was a great supper for me in the days leading up to our wedding. It was a salad, but it was hearty, and it was huge. I ordered the Cobb with the chicken and bacon on the side, which we took home and added to Bjorn’s lunch the next day. I also had enough salad left over for my own lunch at work even after being totally satisfied by my supper**. The Salut Cobb is was a pretty standard Cobb, ingredients-wise: romaine lettuce, grape tomatoes, avocado, hard-cooked egg, blue cheese and garnished with toasted parmesan crisps. The salad comes dressed, but the dressing is light. Still, the salad is rich because of the avocado, blue cheese and eggs. The salad I made contained the tomato, avocado and egg elements, but the Salut’s main influence on my salad was the fact that I made a salad for supper. After living on the salad for 2 meals a day for the months of May and June 2009, I became a believer that a salad can be supper. 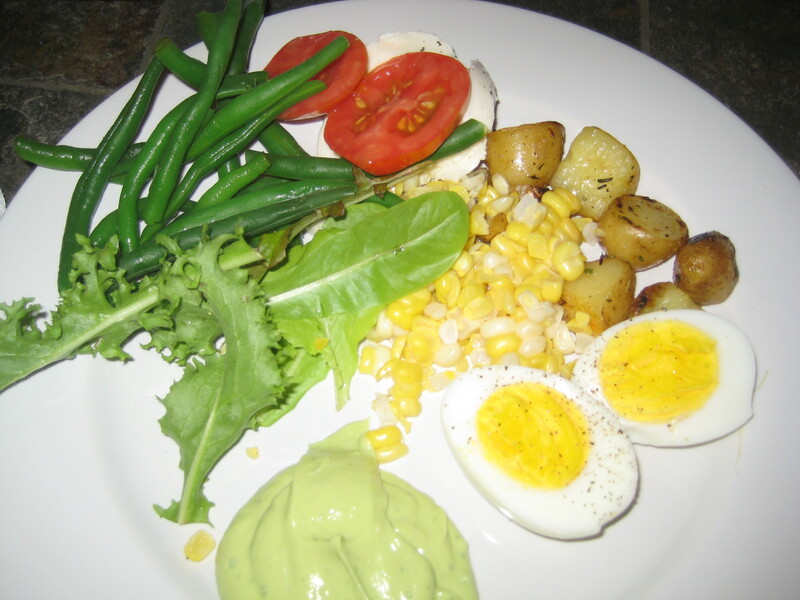 The second source of inspiration for my salad was a traditional Salad Niçoise. 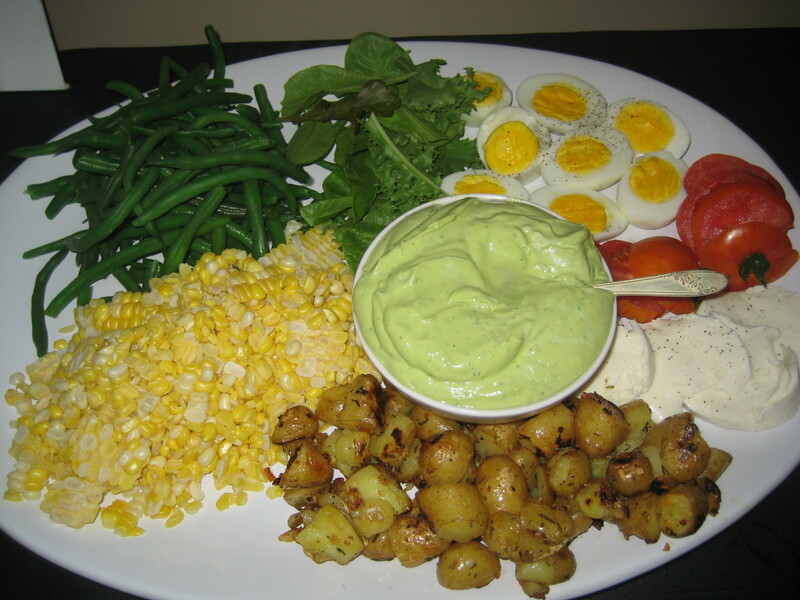 I don’t eat tuna and anchovy which are central elements of this salad, but I planned to use green beans, eggs, and potatoes (in addition to the already mentioned tomato) and the Niçoise is a salad that says “yes you can” to these ingredients in a cold salad. The third and most influential inspiration for my salad was the Ensalada Mixta pictured in Summer Made Easy Special Issue of Everyday Food Magazine in an article called Bask Country with food prepared by Aran Goyoaga. I have already mentioned, this article inspired me to return to blogging after 3 month hiatus earlier this summer. Aran Goyoaga prepared an Ensalada Mixta for a tapas party featured in the article. An Ensalada Mixta is a traditional Spanish salad. Aran Goyoaga served hers stylishly deconstructed, and allured me with its casual elegance and its peeled, soft cooked eggs with their tops cut off. 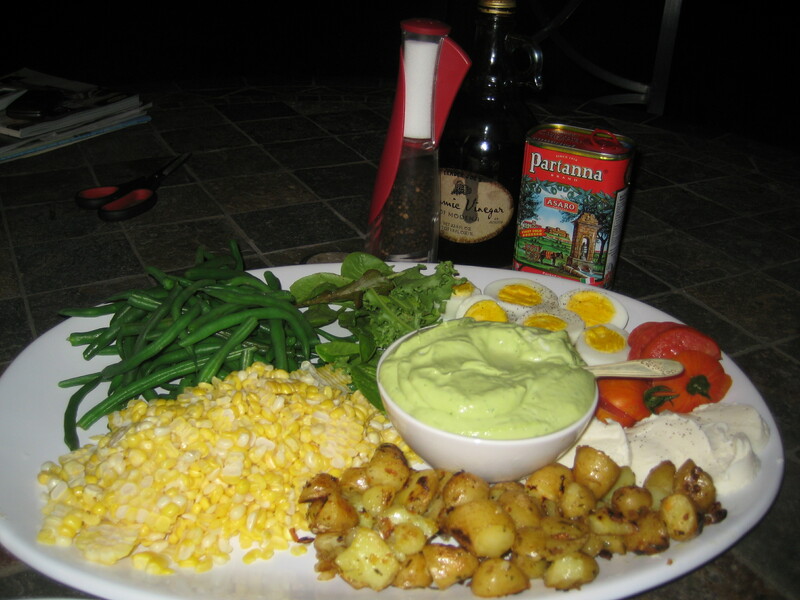 A behind the scenes photo-journal appears on Aran’s blog, and the salad is pictured, in the center of the first photo, and then again, larger, toward the end of article. With elements of all of these salads in mind, I made a salad supper we loved with veggies from our backyard square foot garden and the Saint Paul Farmer’s Market which were fresh and lovely and crying to be a part of an uncomplicated summer meal. I arranged all of the elements of the of Cobb/Niçoise/Ensalada Mixta-influenced salad deconstructed, on a large platter that we were given as a wedding present. The preparation was extremely simple. I boiled and then roasted fingerling potatoes from the farmer’s market with olive oil, crushed garlic and chopped rosemary from our garden and sprinkled a little champagne vinegar at the end to make their flavor bright***. I boiled and peeled eggs, but didn’t manage to get them off of heat in time to make the lovely soft-cooked eggs from the Ensalada Mixta. I picked and rinsed green and Bibb lettuces and frisée from the garden, and sliced garden tomatoes and fresh mozzarella. I sprinkled a little salt and fresh-ground pepper to the potatoes, eggs and tomatoes. 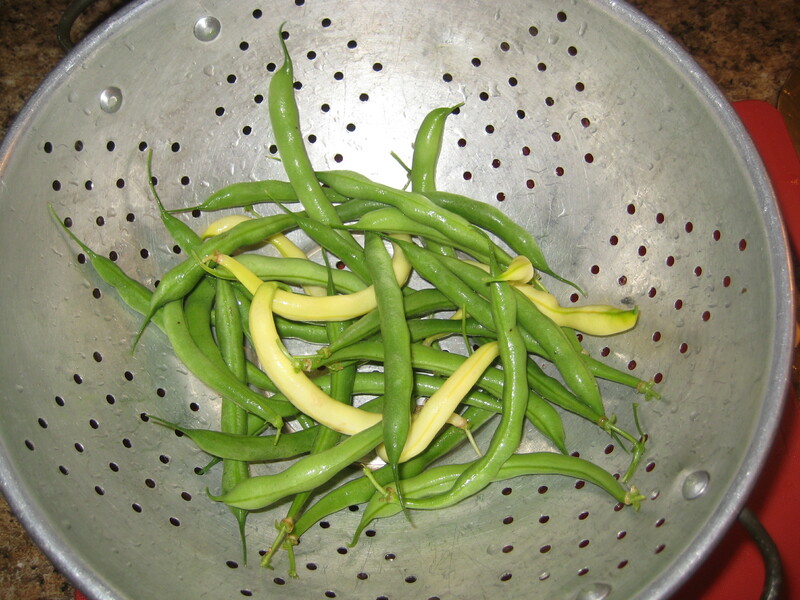 I blanched green beans from our garden and corn from the farmer’s market corn and cut it off the cob. 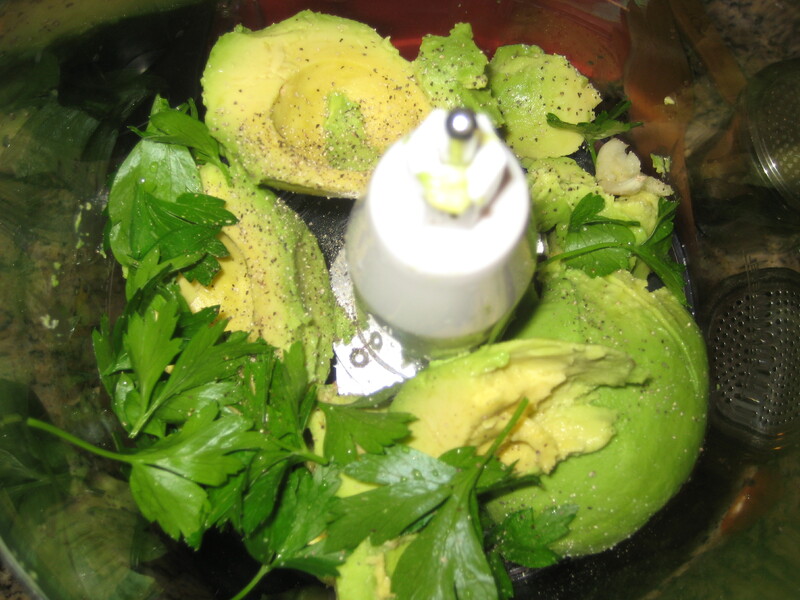 For a dressing, I blended avocado with parsley, salt and pepper and light mayonnaise in the food processor. I was aiming for a Green Goddess-type dressing. The avocado concoction began with great ingredients, but turned out heavy with too much mayo, and missed the mark. I put Olive Oil, Balsamic Vinegar, salt and pepper on the table to allow us to dress our salads to taste on our plates. There are great salads that contain a set list of vegetables and proteins that are dressed in a particular way, such as a Cobb, a Niçoise, or a Caesar. My salad was a concept; a sum of it parts –the ideas and ingredients that influenced its creation. In spite of a less than exceptional dressing, and hard, instead of soft-boiled eggs, it worked out. We enjoyed its simplicity, and were satisfied by it because so many of its elements were hearty. Bjorn commented that the meal had a European feel to it, which makes sense in light of elements being inspired by salads native to France and Spain, both cuisines that prize great ingredients, and prepare them without excess complication. It has its American note to it also, in the Cobb ingredients, avocado and square foot garden-raised vegetables. I am slowly learning that great ingredients, prepared without unnecessary complication and served simply have such a refreshing and satisfying result. *I don’t think I can be convinced that a pizza is a Pizza without cheese. I guess if it became medically necessary for me to eat pizza without cheese due to sudden, extreme lactose intolerance, a pizza like the one I recently read about on the Food in my Beard could perhaps, fill the sad, cheeseless void in my belly. **I won’t lie. I always ate the salad with a hunk of Salut’s bread and some cold salty butter that they bring out to start your meal. This was totally justified, by my choice of a salad as entree, right? I’m sure the chewy bread and butter helped make a salad so satisfying. ***Thank you to our friends Jenny and Ben for introducing us to this wonderful way to prepare potatoes, based on a recipe by Jamie Oliver. This entry was posted in Farmer's Market, Our Garden, Salads, Supper and tagged Avacado, Bibb Lettuce, Blanched, Bread and Butter, Cobb Salad, Corn, Ensalada Mixta, Everyday Food Magazine, Fingerling Potatoes, Fresh Mozarella, Frisee, green beans, Green Goddess, Hard Boiled Egg, Mayonnaise, parsley, Salad Nicoise, Tomatoes by Our Way to Eat. Bookmark the permalink.